Myanmar – known formerly as Burma – is a country infused with history and vibrant, diverse cultural heritage, but many may not realize the depth of wildlife to be found in this land of mystical beauty. International Expeditions new Myanmar tour highlights the country’s rich birdlife, including hooded treepie, Burmese bush lark, Jerdon’s minivet, Burmese yuhina, Jerdon’s bush chat and dark-backed sibia. No reviews yet for this trip. Browse other reviews below for International Expeditions. Travel to Myanmar aboard independent flights to Yangon (Rangoon), crossing the International Date Line en route. Upon arrival, transfer to the Chatrium Hotel, where you enjoy a welcome drink and dinner. After a morning at leisure, start your tour of the city with lunch at a local restaurant. Spend the afternoon strolling through the Bogyoke Market and city center, where most of the town’s remaining colonial-era architecture is located. With over 2000 shops selling a variety of authentic handicrafts, Bogyoke Market is your first opportunity during our Myanmar tour to laugh and haggle alongside local shoppers. Our day ends with a sunset stop at the 2,500-year-old Shwedagon Pagoda, said to enshrine strands of Buddha's hair and other holy relics. Sunset is a particularly rewarding time to visit this gilded temple, which is guarded by two giant chinthe, legendary half- lion, half-dragon figures. Dinner tonight is on your own to savor the distinct flavors of Myanmar. Spend tonight that the Chatrium Hotel. Enjoy a picnic breakfast en route to Hlawga National Park. As we hike through the forest of this zoological reserve, watch for pale-capped pigeon, racket-tailed treepie, striped-throated bulbul — found in Southern Myanmar, sunbird, orioles, flowerpeckers, bee-eaters, some babblers and others. Barking deer, hog deer and wild boar are the most common mammal species, while short-tailed macaques abound. After lunch at one of Yangon’s local restaurants, fly to Heho and drive to Amara Mountain Resort, near Kalaw, our home for two nights. Spend a morning with our hand-selected birding guides, searching for giant nuthatch, spectacled barwing, rusty-cheeked Scimitar-babbler, dark-backed sibia, green magpie, black-breasted thrush, white-browed laughing-thrush, white-capped redstart, brown-breasted bulbul, silver-breasted broadbill, the scarce Burmese yuhina, pin-tailed pigeon, gray-capped pygmy woodpecker and Eurasian jay. This afternoon, join an elephant researcher for an interactive look at Myanmar’s elephant conservation efforts at the new Green Hill Valley Elephant Camp. Enjoy lunch at the camp, and spend our afternoon interacting with these rescued elephants with opportunities to ride, feed and even bathe elephants. While here, you can also hike through this conservation area to observe butterflies, birds and wild orchids. This evening, return to Kalaw. After another early-morning birding excursion, set out for Inle Lake. Along the way, we stop in a small, rural community to learn about the dying art of bamboo umbrella making from local craftsmen. Board boats to travel across the water to our accommodations at Villa Inle Resort, where we spend three nights. Join our local naturalists for a full-day of birding in this rich habitat. Although only 13.5 miles long and seven miles wide, more than 254 species have been recorded at the lake and surrounding wetlands. During our boating excursions we watch for rare Jerdon's bushchat, white-tailed stonechat, collared myna, black-collared starling, rare sarus crane, glossy ibis, ferruginous pochard, spot-billed duck, garganey, pheasant-tailed jacana, black-winged stilt, sandpiper, sooty-headed bulbul, crimson sunbird, clamorous reed warbler, red avadavat and yellow-breasted bunting. Breeding or roosting colonies of egrets; Chinese pond, Indian pond and black-crowned night herons; vinous-breasted, black-collared, chestnut-tailed and Asian pied starlings; and collared, jungle, white-vented and common mynas are also found around the lake and surrounding marshes. Today offers a rare immersion into the region’s culture as we meet people from four different cultures — Shan, Inntha, Pa-O and Danu — during our full-day exploration of Inle Lake. As our boat makes its way through the floating villages, we stop to mingle with locals at one of the markets which hopscotch around the lake on a five-day cycle and view a floating garden. Chat with an Inntha fishermen as he waits for the day’s catch, and witness the Inntha technique of leg rowing, where one leg is wrapped around the paddle to drive the blade through the water. Also learn about cottage industries supporting the local economy such as cigar making, silk weaving, noodle making and more. Warm local families invite us into their house for a glimpse at daily life. Our small group also explores an ancient teak wood monastery, home to Shan-style images of Buddha and thrones. Fly to Mandalay, enjoying lunch at a local restaurant before heading to iconic Sagaing on the Irrawaddy River. Sagaing is a religious and monastic center, with numerous Buddhist monasteries. It briefly regained its position as a royal capital of Burma from 1760-1764. The British built the 16-span Innwa Bridge connecting Sagaing with Mandalay in 1934. While walking along Sagaing Hill, watch for birdlife such as white-throated babbler, endemic Burmese bushlark), pied avocet, green and blue-tailed bee-eaters, oriental darter and more. Tonight, enjoy dinner and a performance featuring traditional dance and music. Spend two nights at the Rupar Mandalar Resort. Spend an early morning in silence as we soak up the tradition and reverence of breakfast with the thousand monks at Amarapura Mahagandayone Monastery. After the watching their breakfast, we accompany the monks to morning prayers. Enjoy sunrise on the 250-year-old U Bein Bridge before returning to our hotel for time at leisure. Spend our afternoon immersed in the bustling city of Mandalay, Myanmar’s second largest city. Visit Shwe Nan Daw Kyaung and Kuthodaw Pagoda (the world's largest book). See Myanmar handicraft workshops such as Kalaga tapestries, silk weaving which is different from Inle Lake silk weaving, and gold leaf making. Visit a bustling market of this Myanmar last Royal capital which is also the 2nd largest city of the country. Enjoy lunch in a local restaurant. Stroll along the backs of the Irrawaddy River bank and enjoy sunset. Enjoy a full-day Irrawaddy River cruise aboard our private boat, exploring the cultures and scenery offered along the riverbank. Our small group plans to explore the small village of Yandabo. Accessible only by water, Yandabo is renowned for its terra cotta pottery made using mud from along the banks of the Irrawaddy. A hands-on demonstration allows us to examine this traditional craft at various stages of production. Yandabo is also known in Burmese history as the location where the Burmese king and British representatives signed the Treaty of Yandabo in 1855. Continue to Bagan, where we spend the next three nights at Bagan Thande Hotel. Spend a full-day birding along the Irrawaddy and ancient temples in a region that is particularly rewarding for wildlife enthusiasts. Sheltered from the southwest monsoon by high mountains, central Myanmar receives little rainfall and is a true semi-desert, characterized by cactus-like euphorbia, acacias and thorny scrub woodland. During our excursion we may observe river lapwing, great thick-knee, small pratincole, Indian sandlark and possibly even the increasingly rare black-bellied tern or Indian skimmer. Large numbers of ruddy shelduck winter along the river’s margin along with other water birds. After breakfast, tour the archaeological zone of Bagan. Intermingled with the three types of temples – Gubyaukgyi, Ananda and Htilominlo – which represent different periods and styles of building, we may spot a variety of endemic bird species during our walking tour. Visit the massive Dhamayangyi temple before lunch at a local restaurant in Nandawun Garden on the river bank. Browse crafts and learn about traditional lacquer ware at a local workshop. A horse-drawn cart transports our group among the temples and local villages this afternoon. 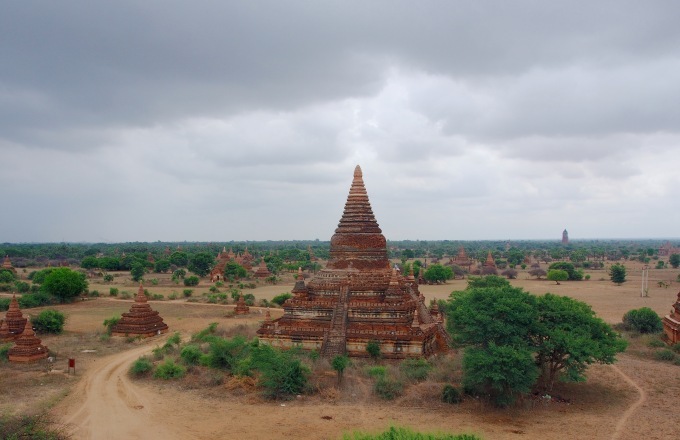 Visit Minanthu Village and Bagan dynasty's last temple Phaya Thonezu, the golden stupa of Shwezigon Pagoda. Enjoy a breathtaking sunset vista from a temple terrace before returning to our hotel. Fly to Yangon, where we spend an enriching day in the small village of Ngagylinn. International Expeditions is working with the Parami Foundation to support educational efforts in the village. The Parami Foundation was organized to exclusively support education in disadvantaged mostly rural communities in the Delta Region and Upper Myanmar. Until recently, there was no electricity or school in this remote village of 300. Our group is welcomed into the community for a traditional lunch and green tea in the village monastery before being immersed in the daily lives of the local families. Children and teachers invite us into their school and library, while later, the adults educate us on farming and other small businesses that support the village. Return to Yangon, stopping en route at the Second World War Memorial Cemetery. After a festive farewell dinner, say good-bye to your fellow Myanmar tour guests and spend tonight at Chatrium Hotel. After breakfast, transfer to the Yangon airport to board your independent flights home. All cancellations become effective upon written receipt by IE. Custom and group bookings may have special cancellation terms in lieu of those noted below. Certain air, permits and items sold as “non-refundable” are in addition to other imposed cancellation fees.